The more we learned about the current crop of robo advisory firms, the more we realized we could do better. This brief blog post hits the high points of that thinking. It appears that all major robo advisory companies use 50+ year-old MPT (modern portfolio theory). At Sigma1 we use so-called post-modern portfolio theory (PMPT) that is much more current. At the heart of PMPT is optimizing return versus semivariance. The details are not important to most people, but the takeaway is the PMPT, in theory, allows greater downside risk mitigation and does not penalize portfolios that have sharp upward jumps. Robo advisors, we infer, must use some sort of Monte Carlo analysis to estimate “poor market condition” returns. We believe we have superior technology in this area too. Finally, while most robo advisory firms offer tax loss harvesting, we believe we can 1) set up portfolios that do it better, 2) go beyond just tax loss harvesting to achieve greater portfolio tax efficiency. This entry was posted in Portfolio Optimization Software, Robo Advisors, Tax Optimization, Wealth Management and tagged Entrepreneurship, portfolio analysis, portfolio strategies, quantitative analysis, risk, risk models, software, startups, tax efficiency, tax strategies. Bookmark the permalink. The previous post showed after-tax results of a hypothetical 8% return portfolio. The primary weakness in this analysis was a missing bifurcation of return: dividends versus capital gains. The analysis in this post adds the missing bifurcation. It is instructive to compare the two results. This new analysis accounts for the qualified dividends and assumes that these dividends are reinvested. It is an easy mistake to assume that since the qualified dividend rate is identical to the capital gains rate, that dividends are equivalent to capital gains on a post-tax basis. This assumption is demonstrably false. This insight suggests an interesting strategy to potentially boost total after-tax returns. We can assume that our “6+2” model represents the expected 30-year average returns for a total US stock market index ETF like VTI, We can deconstruct VTI into a value half and a growth half. We then put the higher-dividend value half in a tax-sheltered account such as an IRA, while we leave the lower-dividend growth half in a taxable account. This value/growth split only produces about 3% more return over 30 years, an additional future value of $2422 per $10,000 invested in this way. While this value/growth split works, I suspect most investors would not find it to be worth the extra effort. The analysis above assumes that the growth half is “7+1” model. In reality the split costs about 4 extra basis points of expense ratio — VTI has a 5 bps expense ratio, while the growth and value ETFs all have 9 bps expense ratios. This cuts the 10 bps per year after-tax boost to only 6 bps. Definitely not worth the hassle. Now, consider the ETF Global X SuperDividend ETF (SDIV) which has a dividend yield of about 5.93%. Even if all of the dividends from this ETF receive qualified-dividend tax treatment, it is probably better to hold this ETF in a tax-sheltered account. All things equal it is better to hold higher yielding assets in a tax-sheltered account when possible. Perhaps more important is to hold assets that you are likely to trade more frequently in a tax-sheltered account and assets that you are less likely to trade in a taxable account. The trick then is to be highly disciplined to not trade taxable assets that have appreciated (it is okay to sell taxable assets that have declined in value — tax loss harvesting). 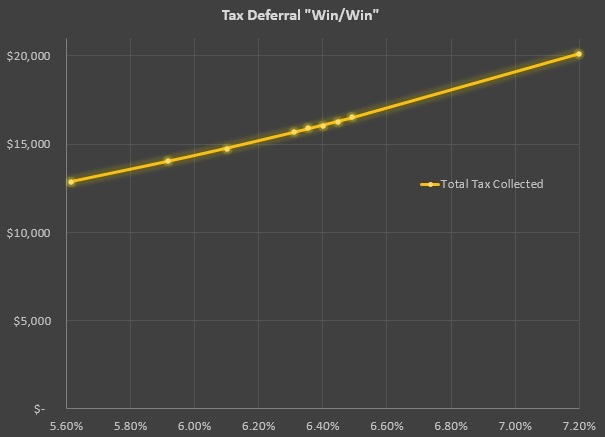 The graph shows the benefits of long-term discipline on after-tax return, and the potential costs of a lack of trading discipline. Of course this whole analysis changes if capital gains tax rates are increased in the future — one hopes one will have sufficient advanced notice to take “evasive” action. It is also possible that one could be blindsided by tax raising surprises that give no advanced notice or are even retroactive! Unfortunately there are many forms of tax risk including the very real possibility of future tax increases. This entry was posted in Tax Optimization, Taxes, Total Return, Wealth Management and tagged tax efficiency, tax risk, tax strategies, trading strategies, Wealth Management. Bookmark the permalink. Figure 1. Tax Deferral benefits both parties. When asked to consider tax deferral investment strategies, many people instinctively conclude that tax deferral benefits the investor at the expense of the government. Such a belief is half-right. Tax deferral ultimately benefits both the investor and the government’s tax revenues. While there are exceptions involving inheritance, in most other cases both parties benefit. Figure 1 summarizes the relationship between higher after-tax returns and higher nominal net cash flows to the government. When investors, investment advisors, and fund managers successfully defer long-term capital gains, investors and governments win in the long run. The phrase “in the long run” is important. When taxes are deferred, the government’s share grows along with the investor’s. In the short term, taxes are reduced; in the long run taxes are increased. For the investor this long-run tax increase is more than offset by increased compounding of return. Please note that all of these win/win outcomes occur under a assumption of fixed tax rates — which is 20% in this example. It is also worth noting that these outcomes occur for funds that are spent at any point in the investor’s lifetime. This analysis does not necessarily apply to taxable assets that are passed on via inheritance. Critical observers may acknowledge the government tax “win” holds for nominal tax dollars, but wonder whether it still holds in inflation-adjusted terms. The answer is “yes” so long as the the investor’s (long-run) pre-tax returns exceed the (long run) rate of inflation. In other words so long as g > i (g is pre-tax return, i is inflation), the yellow line will be upward sloping; More effective tax-deferral strategies, with higher post-tax returns, will benefit both parties. As inflation increases the slope of the yellow line gets flatter, but it retains an upward slope so long as pre-tax return is greater than inflation. It is okay to realize some ST gains, however it is important to offset those gains with capital losses. The simplest way of achieving this offset is to realize an equal or greater amount of ST capital losses within the same tax year. ST capital losses directly offset ST capital gains. A workable, but more complex way of offsetting ST gains is with net LT capital losses.The term net is crucial here, as LT capital losses can only be used to offset ST capital gain once they have been first used to offset LT capital gains. It is only LT capital losses in excess of LT capital gains that offset ST gains. Because ST capital losses are better than LT, it often makes sense to see how long you have held assets that have larger paper (unrealized) losses. All things equal it is better to “harvest” the losses from the ST losers than from the LT losers. Managing net ST capital gains can potentially save you a large amount of taxes, resulting in higher post-tax returns. Deferring LT capital gains requires patience and discipline. Motivation can help reinforce patience. For motivation we go back to the example used to create Figure 1. The example starts today with $10,000 investment in a taxable account and a 30-year time horizon. The example assumes a starting cost basis of zero and an annual return of 8%. Tax “event” impact on after-tax returns. The most important thing to notice is that if an investor can completely avoid all “tax events” for 30 years the (compound) after-tax return is 7.2% per year, but if the investor triggers just one taxable event the after tax return is significantly reduced. 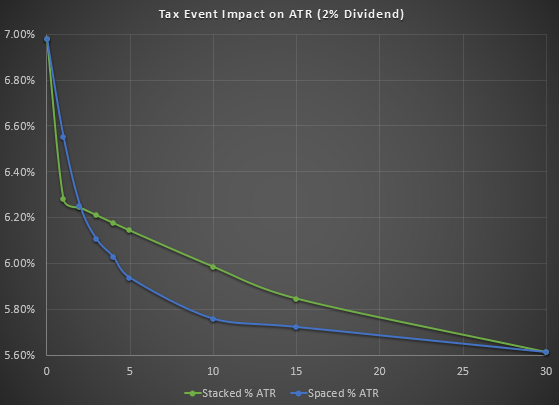 A single “stacked” tax event in year 1 reduces after tax returns to 6.49% while a single “spaced” tax event in year 15 reduces returns to 6.67%. 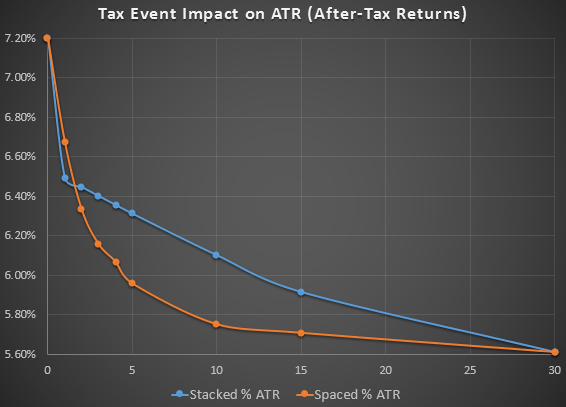 Thus for a single event the spaced tax event curve is higher, while for all other numbers of tax events (except 30 where they are identical) it is lower than the stacked-event curve. The main take-away from this graph is that tax deferral discipline matters. The difference between 7.2% and 6.67% after-tax return, over thirty years is huge when framed in dollar terms. With zero (excess) tax events the after-tax result in year 31 is $80,501. With one excess tax event (with the least harmful timing!) that sum drops to $69,476. In the worst case the future value drops to $51,444 with an annual compound after-tax return of only 5.61%. One of the challenges faced when bringing fresh perspectives to the tax-plus-investing dialog is in providing examples that paint the broad portfolio tax management themes in a concise way. The first challenge is that the tax code is constantly changing, so predicting future tax rates and tax rules is an imprecise game at best. The second challenge is that the tax code is so complex that any generalization will mostly likely have a counterexample buried somewhere in the tax code. The third complication is that baring significant future tax code changes and obscure tax code counterexamples, creating a one-size-fits-all model for investors results in large oversimplifications. All models are wrong. Some are useful. This common saying in statistics gets to the heart of the problem and the opportunity of investment tax management. It is better to build a model that gives deeper insight into opportunities that exist in reconciling prudent tax planning with prudent investment management, than to build no model at all. The simple tax model used in this blog post makes some broad assumptions. Among these is that the long-term capital gains rate will be the same for 30 years and that the investor will occupy the same tax bracket for 30 years. The pre-tax return model is also very simple: 8% pre-tax return each and every year. I would like to highlight the oversimplification I think is most problematic from a tax perspective. The model assumes all the returns (8% per year) are in the form of capital appreciation. A better “8%” model would be to assume a 2% dividend and 6% capital appreciation. Dividends, even though receiving qualified-dividend tax treatment, would bring down the after-tax returns, especially on the left side of the curve. I will likely remedy that oversimplification in a future blog post. Tax deferral does not hurt government revenues; it helps in the long run. Realized net short-term capital gains can crater post-tax investment returns and should be avoided. Deferral of (net) long-term capital gains can dramatically improve after-tax returns. Tax deferral strategies require serious investment discipline to achieve maximum benefit. Even simple tax modelling is far better than no tax modelling at all. Simple tax models can be useful and powerful. Nonetheless, investment tax models can and should be improved over time. This entry was posted in Tax Optimization, Taxes, Total Return, Wealth Management and tagged portfolio strategies, tax efficiency, tax risk, tax strategies. Bookmark the permalink.